OMG yes. I've been wanting that one ever since I saw the animated short. Hope you're having a blast! I'm totally jealous sitting here through Armchair BEA watching you guys but am also living vicariously through you all! That looks adorable! I must get a copy for the niece and nephew. Hope you are having a great time, and that book looks wonderful. It sounds like you are having such a wonderful time! 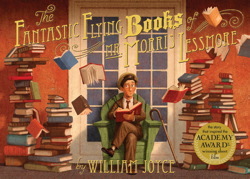 I didn't realize they'd turned the short film of The Fantastic Flying Books into a book! I've just preordered a copy and I know I'll be buying another for my niece and nephews. M.A.D. : BEA was pretty epic. I loved meeting so many blogging friends (and making new ones!). fredamans: I heard such great things about Armchair BEA this year! I think it has really grown into its own, and if I can't make it to BEA next year I'll definitely be participating. Liviania: YES! I'm adding this one to my 'automatic buy' for friends' little ones. 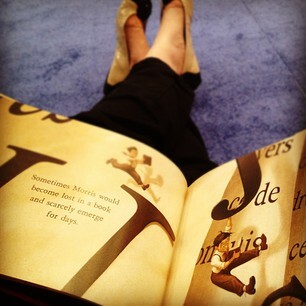 So adorable and great for cultivating book lovers. Ryan: Thank you! And yes, it is a beautiful book. Melissa: I know, I didn't realize they'd made it into a book, either! But it totally makes sense, since it's all about... books! Yay!